As some of you may know, TV Whirl's 16th birthday was on the 22nd March (I would have posted last night, but news events of yesterday evening didn't make a celebration seem particularly appropriate). Yep, we've been here through thick and thin since 2001 now, which is probably before some forum members were even born! To celebrate, every day for the next 16 days over on the site's Twitter feed, I'm digging out all the old designs and the actual clips from those golden olden days. Yes, it's going to be your chance to relive such gems as the animated GIF logo from revision 2.6, those 10 fps video clips in RealMedia Format, and that time when the site used to have a mocks section on there, optimistically called 'tesfun'. I can also promise boatloads of purple in more garish shades than you can imagine, and that Harlow Solid Italic font that just never goes away. You can track everything under the hashtag #16ness. I did want Parr to film it all with some dodgy camerawork, but he was busy so you'll just have to make do with me! Away from the birthday stuff (which is continuing for a few more days over on the Twitter account), I've been continuing uploading quite a few other updates on the site of late. The HTV section in particular has seen new material added mostly from Christmas 1996, with their stopframe animation festive look, and Christmas 2000, with their ever-loved robin edited hearts branding. There's also a very small amount of Meridian content added from a random tape from 1998 which was found in the collection, although no one really knows how it got there. As well as that, several new teletext streams have been added to the site. The aforementioned HTV Christmas 1996 presentation comes with suitably festive text from HTV West of the time as does the Meridian one coming with Teletext ITV South (although no Meridian ancillary service was present in the recovery data). As mentioned over in the Channel 5 thread, a short ITN bulletin from overnight just in to 31/3/1997 has also been added complete with the accompanying Channel 3 North East teletext stream. Dating from only hours after the launch of C5, there are quite a few references abound to the new station. A batch of new content from HTV in late 1997 has been added to the site today. Including promos, next slides, and newer versions of the programme genre idents that had been in use for a few years. Now set in a blue-on-yellow style which looks less like the main ident of that era and much more akin to the ident that was set to follow in 1999. Also to those who are interested in this sort of thing, all of these are delivered in 50fps after a lot of experimenting and some very recent hardware upgrades. I'm hoping most clips on the site can be delivered this way going forward. After quite a few streams from the commercial sector had been added to the site, it was about time there were finally some text streams from the BBC's Ceefax service. A few have been added to a new page on the site in the last week. The most notable of these has been added to the site today. Dating from the 6th September 1997, it features the BBC1 Ceefax service that was being broadcast early in the day on the day of Princess Diana's funeral, giving a unique insight to a day we'll never see covered in this way again now. Television and radio listings are thrown out of the window, with a rare now and next page featuring all but one channel showing the same thing. Travel sections are dedicated to getting people in and out of London with lots of details of road closures and extra train services, and sporting pages detail events being called off. You can find sections such as children's and music adding their own slant to things. Whoops. Looks like someone didn't get page 500 updated when Newsround's logo changed (they must've waited for CBBC's rebrand a few months later before changing it). And am I right in thinking Mother Teresa's section pre-empted the local news? They do seem to replace the regional news with a section of pages devoted to Mother Teresa, although I'm not entirely sure why they didn't just have them in addition (assuming they had the regional pages in all regions in 1997 - I'll have to check some other stuff from around the time). Certainly I'd have thought such news events were exactly the sort of thing where the regions would be in their element with the obligatory 'how this affects people locally' style stories. Quite interesting to see the radio schedules there - didn't realise all 5 BBC networks carried the funeral, with 2, 3 and 5 Live taking Radio 4 while Radio 1 did its own Newsbeat coverage. I've been making quite a big effort to pull some of the more recent presentation areas on the site uptodate, with a lot being added to BBC One in the last week. Nothing especially revolutionary there although probably a few different junctions to those other people have uploaded... but I thought it was about time some of the holes started being plugged. Quite a few folks (okay... one person) have asked if I'll be doing any election coverage on the site this year as I'm a bit more active with updates. I've put up one or two news openings recently, but in this Youtube generation I suspect the whole programmes will just be uploaded online somewhere anyway so there's not likely to be anything indepth. 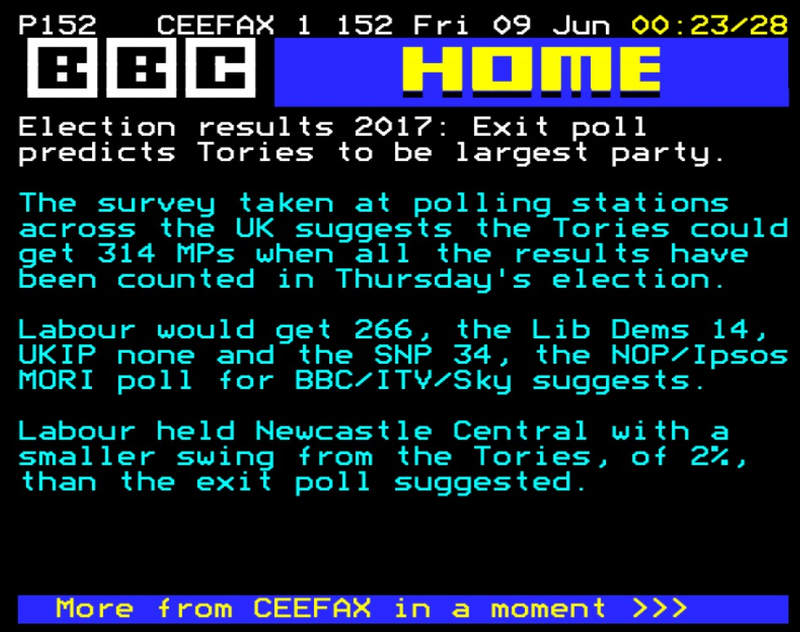 But instead... why not enjoy our alternative TV Whirl election selection... with some random teletext pages related to elections past! I find the logo on that ITN page really interesting, in using a lower case N - presumably as it was easier to render. I think it was either that or make the N much wider than it should be. And avoiding diagonals looks better on Teletext anyway, as a diagonal line would render looking like a staircase! I seem to remember reading somewhere about level 2 teletext which, amongst other things, made it look prettier rather than standard red/yellow/green/white/blue on black that we all became used to.